I kind of love it, and it was really quick and easy to build. ANYONE can make this! I have teamed up with BuildSomething, Kreg's new DIY project plan site to bring you the free plans so you can build your own! 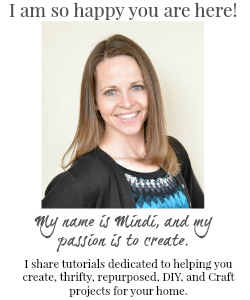 You can get the free plans HERE. 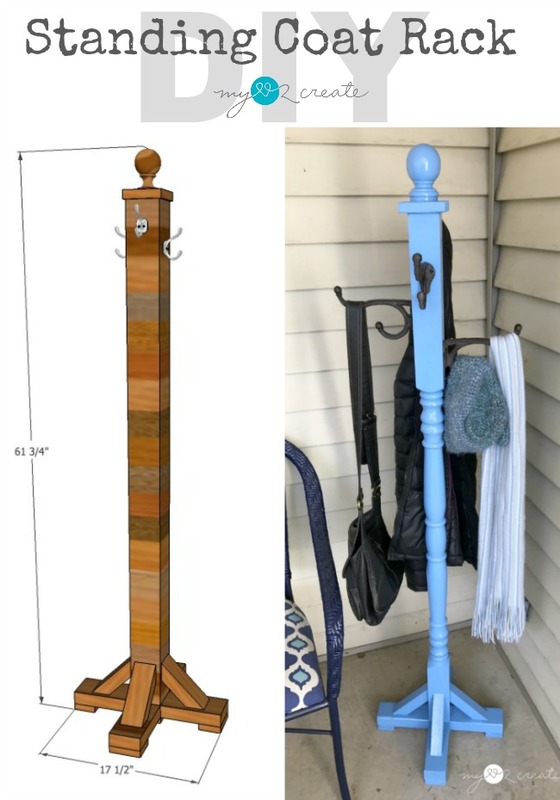 I originally was going to use a 4x4 post to make this, which is what is drawn up in the plans, but then I remembered I had this cute Newel post that I had gotten from the Restore for on $1, and I had to use it! 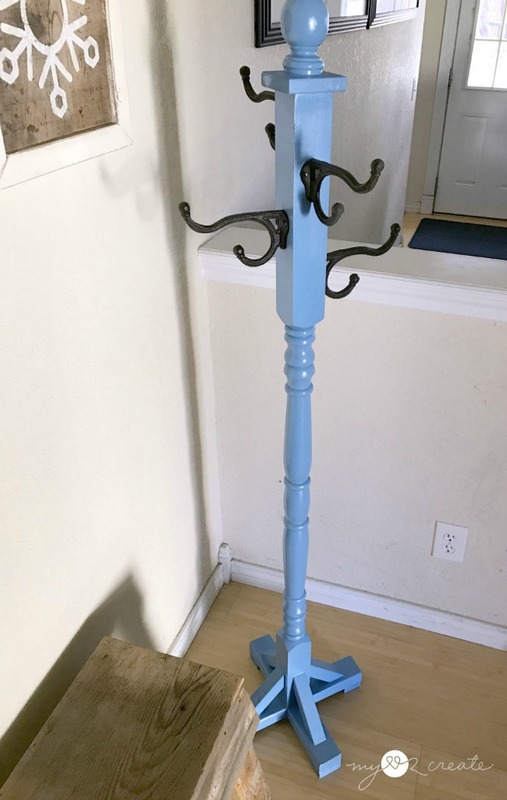 You can use any type of post you want for your coat rack. Can you see that price tag?! Woo hoo! I actually bought a few of these several years ago. I made my Kids street sign with one, but this is only the second one I have used. I had to cut the ends on my miter saw so they were square. 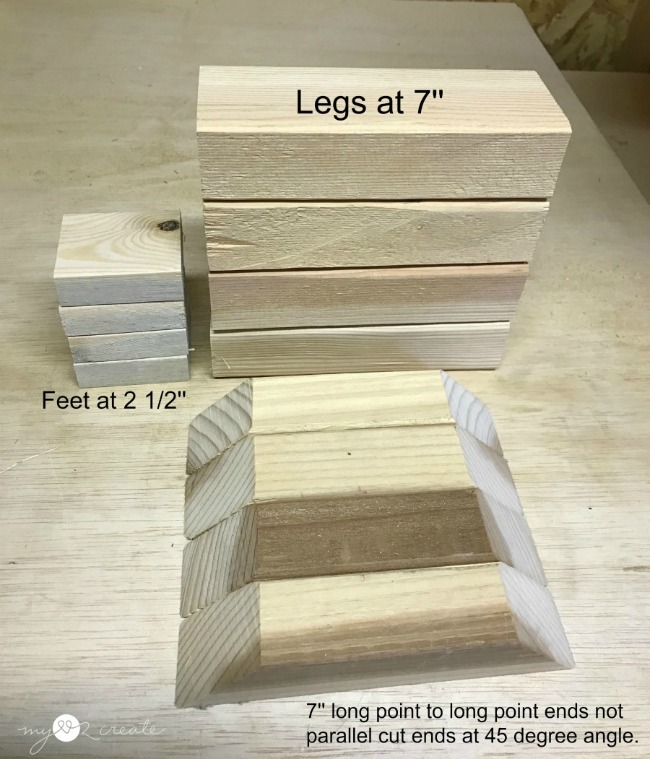 Because the post I used for my coat rack was 2 1/2'' square instead of 3 1/2'' square like a 4x4, I had to modify the feet to match the width of the post. I used 2x3's for the legs, 1x3's for the feet, and 2x2's for the angled supports. All the measurements are the same as the original plans. 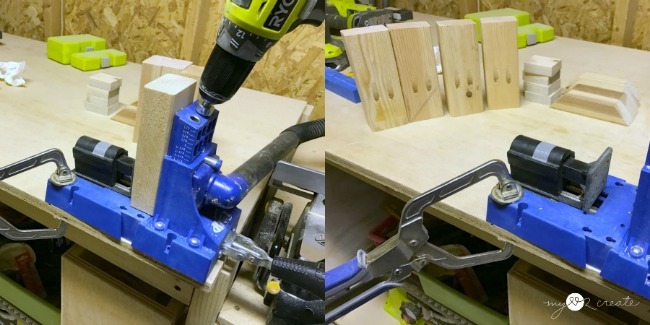 I used my Kreg K5 Pocket-Hole Jig to drill my 1 1/2'' pocket holes into the legs. 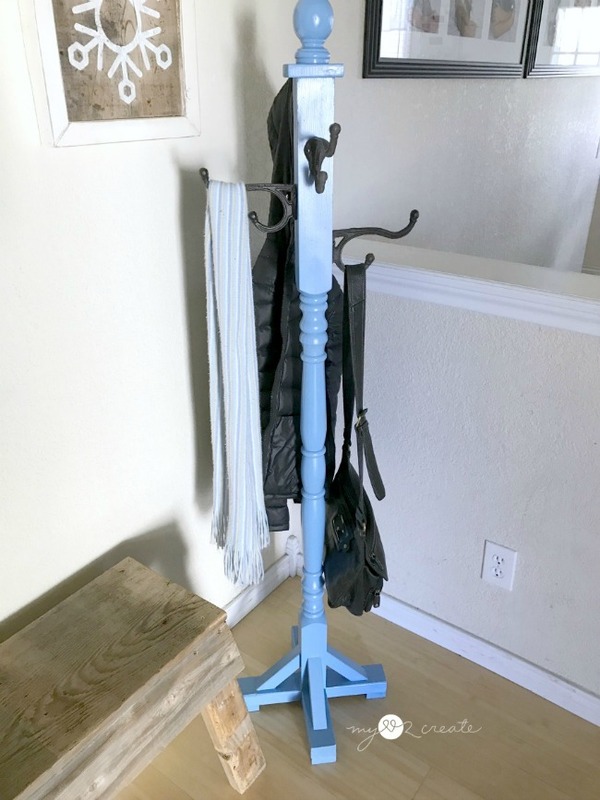 I designed this so that the post actually sits on the floor with the feet, to add stability. 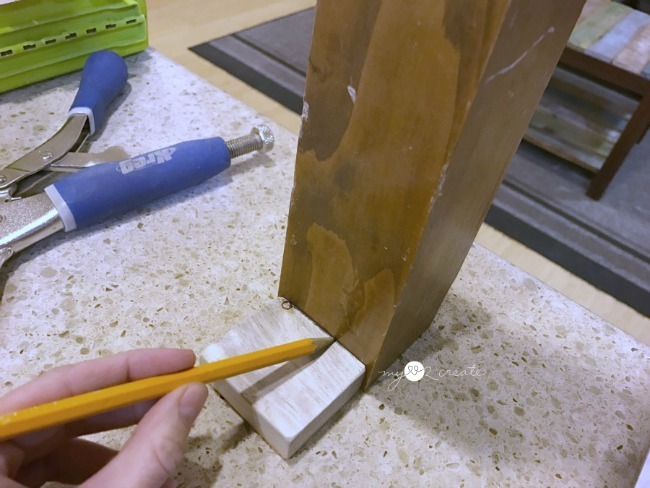 In order to get the correct placement for your legs, take a scrap 1x3 and use the 3/4'' side to mark all sides of your post. Then attach your legs with glue and 2 1/2'' pocket hole screws 3/4'' from the bottom (at the line you just drew). 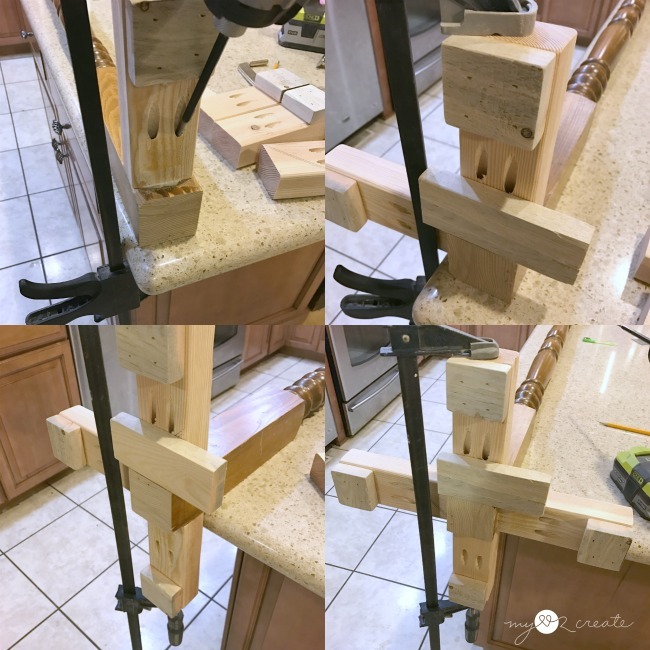 I clamped the legs while drilling in the screws. 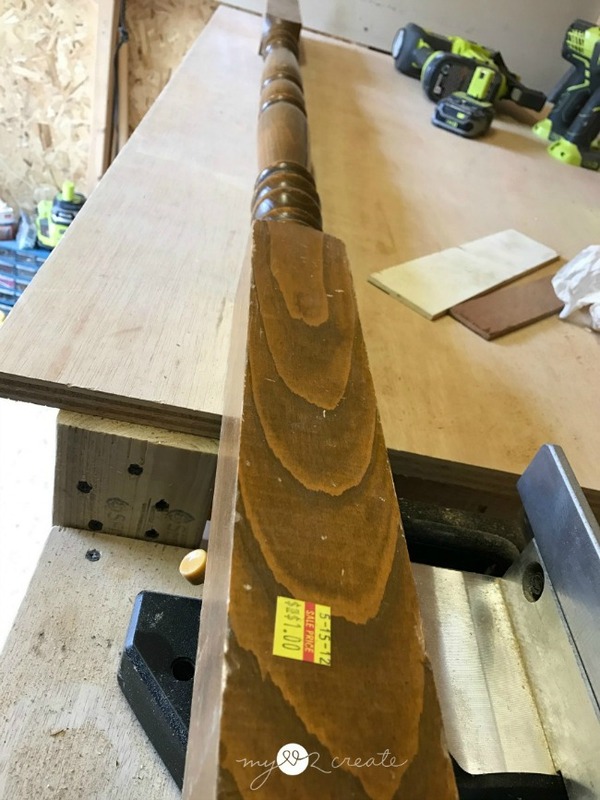 You can see I used a 1x3 set on the end, this scrap piece was flush with the bottom of the post while I clamped on the feet to ensure it was properly placed. 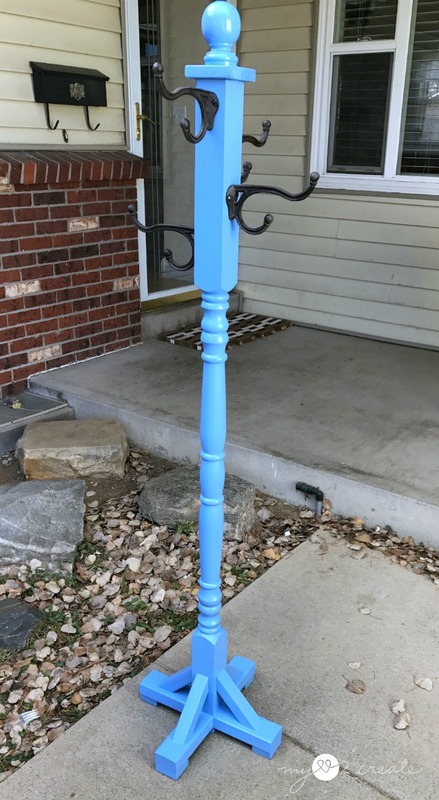 I had to move the post to the end of the counter to add the last two legs. 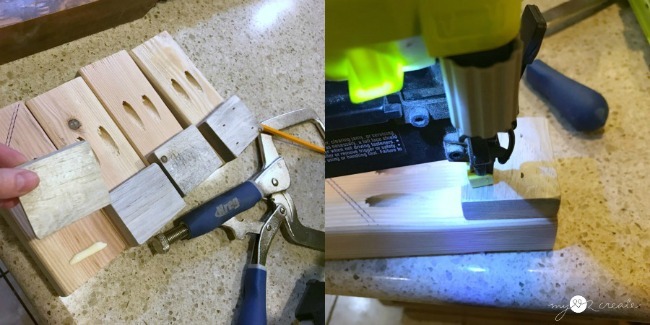 The angled supports are more decorative than supportive, so they can be optional. 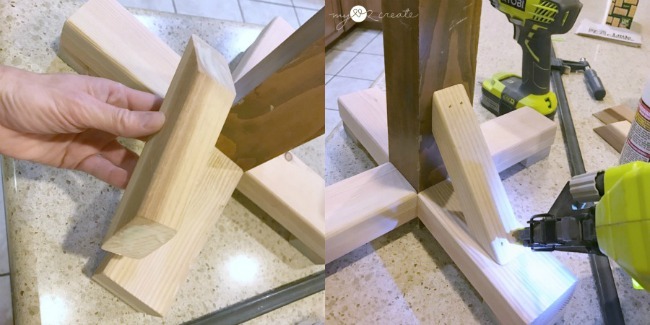 Place them in the center of the legs and the post and glue and nail them on with 2'' finish nails. When I nailed into the feet I made sure to go in at an angle. 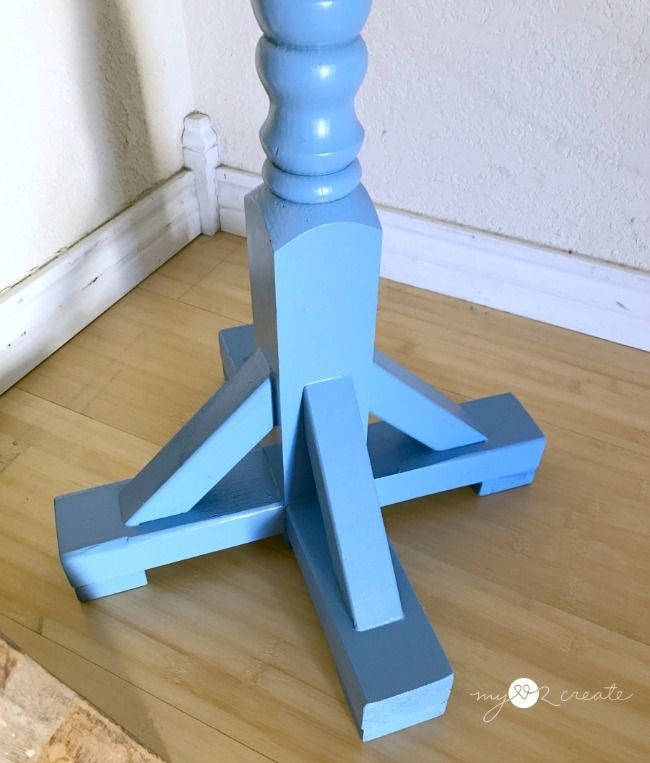 I used a scrap piece of 1x4 for the base of my ball finial. 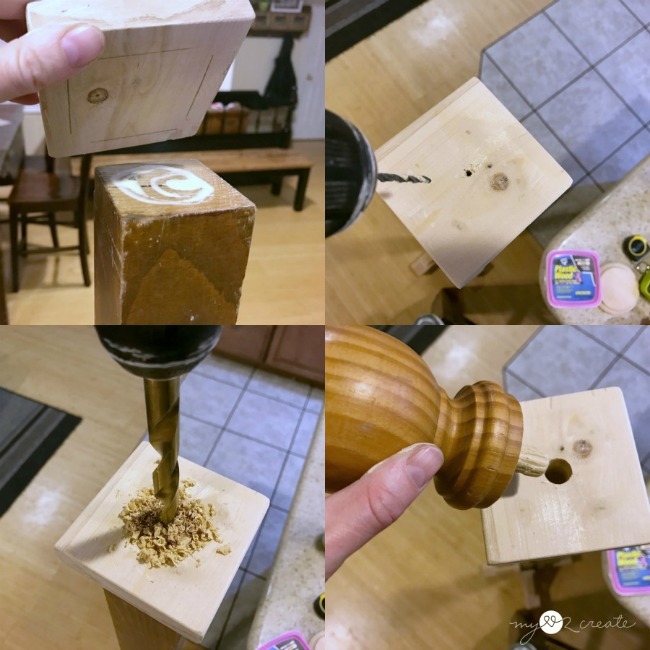 I measured 1/2'' on all sides and then glued and nailed it to the top After marking center I drilled a small guide hole as a guide before drilling the bigger hole for my finial. 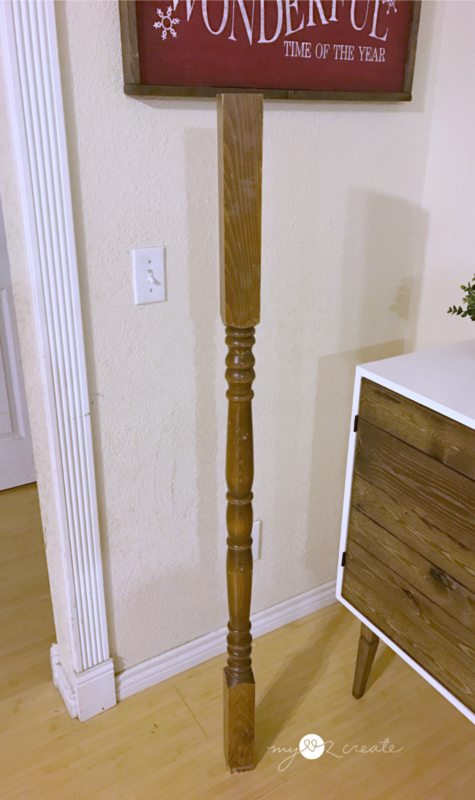 I got this finial from a bag of random ones at the Restore, I am not sure where it was originally from, but most finial's will have a metal piece you can screw into the wood. That was it for my build! See I told you it was easy! I did some staging outside since my basement doesn't have the best lighting. I love that each hook allows you to hang two things, with lots of room. These hooks are 6'' long! 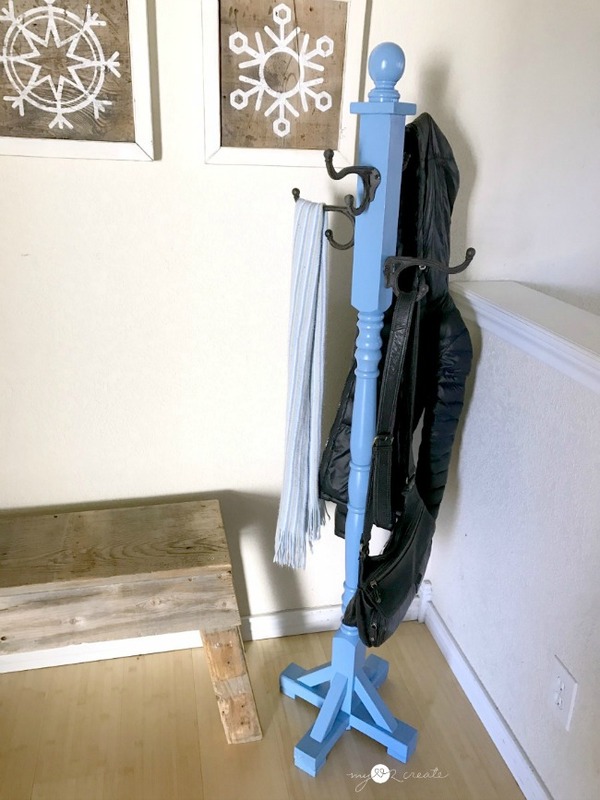 It hardly takes up any room and would be great for a guest room as a place to hang clothes. I am going to bring it upstairs when we have guests over in the winter to avoid opening the hall closet. 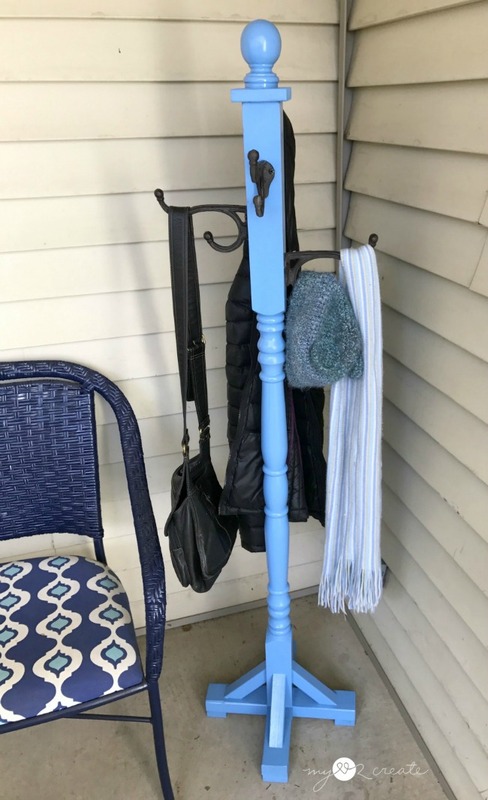 I can see this as being a perfect entryway piece right next to a bench! It would make a great gift, so maybe someone on your Christmas list needs one?! I think it would look super nice painted white...which is what I would have done if the kids weren't getting it! ;) Or nicely stained would look pretty too! 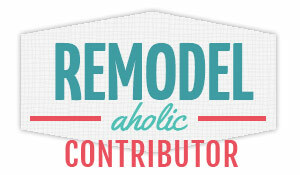 Now head on over to Build Something for the free plans and get building! I love that blue you chose! 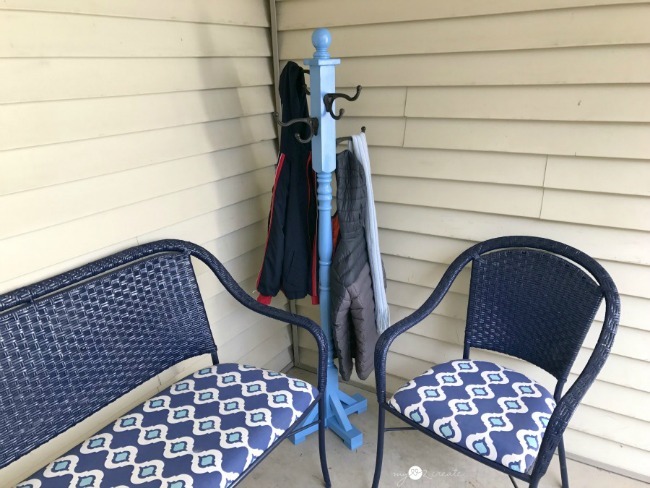 Thank you for sharing with us at the To grandma's house we go link party! Hope to see you there tomorrow when the new party starts!